Wedad Rami is a young student at An-Najah university in Nablus who, in addition to her studies, is a volunteer at the Hayat Centre for Civil Society Development-Palestine. This is an article she wrote for the Dundee-Nablus Twinning Association. In it she describes her recent experience of picking olives with some friends. As she makes clear even this peaceful activity is fraught with danger from the illegal Israeli settlers. Palestinian farmers start picking their olive trees in the autumn months (September, October and November). The whole Palestinian family participates in this tiring, wonderful, and joyful harvest. In fact, many Palestinian families depend for their livelihood on the olive harvest because they can make from the olive tree many productive things, such as olive pickle, olive oil, olive soap, and also they can use olive wood in manufacturing furniture. My friend’s family have land in Deeristia village – near Nablus – which is full of olive trees. 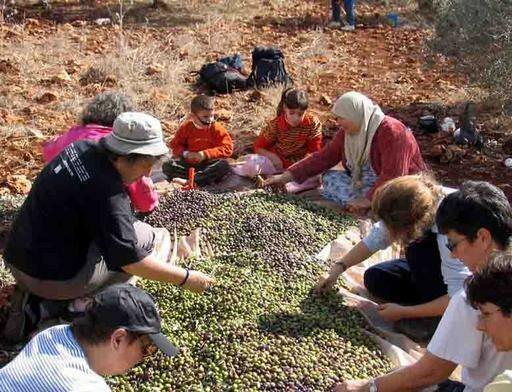 She asked me and other friends to help her family in picking the olives. Actually, she asked us to do that because their land lies near a Jewish settlement and the Israeli soldiers gave them an exact time to finish their picking and If they don’t finish it in the exact time they will prevent them from continuing their picking. As you know Palestine is an occupied country and as a result of the Israeli Occupation this interesting harvest can be miserably turned into an unpleasant one, simply because of the difficulties that the farmers are exposed to from Israeli soldiers. These range from preventing the farmers from harvesting their trees, expropriating land, to even uprooting their olive trees. Actually, after these abusive practices what do you expect from this poor farmer ??? Do you think he will leave his land ??? For sure No, he will insist to stay in his land, never giving up and willing to die for his irreplaceable and invaluable land – indeed as he called it his honor. 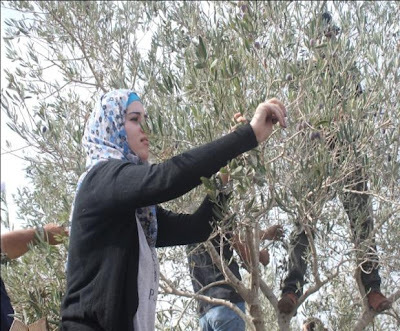 Clearly, the reaction of Palestinian farmers towards zionist aggression reveals an important issue which is the strong relationship between the Palestinian farmer and the olive tree. Challengingly, Palestinian farmers stand in front of Israeli zionists just as the olive tree does. Although the Olive tree was exposed to harm from the zionist soldiers, it is still digging its roots deep in the earth and can regrow again and again. Indeed, Palestinians are still staying here in Palestine like the olive tree. This entry was posted in Israeli Settlers & Settlements, Nablus, Olive Picking/Planting and tagged Nablus, settlements, West Bank. Bookmark the permalink.